I ran into several problems when I first tried it so I thought a how-to guide might be helpful. 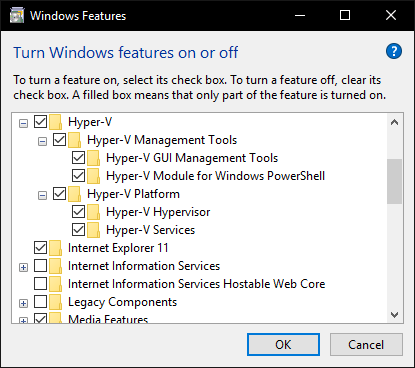 To enable Hyper-V you need to open the “Turn Windows features on or off” dialog (accessible using the start menu) and check all the Hyper-V options. WARNING: Once you enable Hyper-V some other virtualization software will stop working. This includes VirtualBox (and the Android emulator). To get these running you need to uncheck these options again. 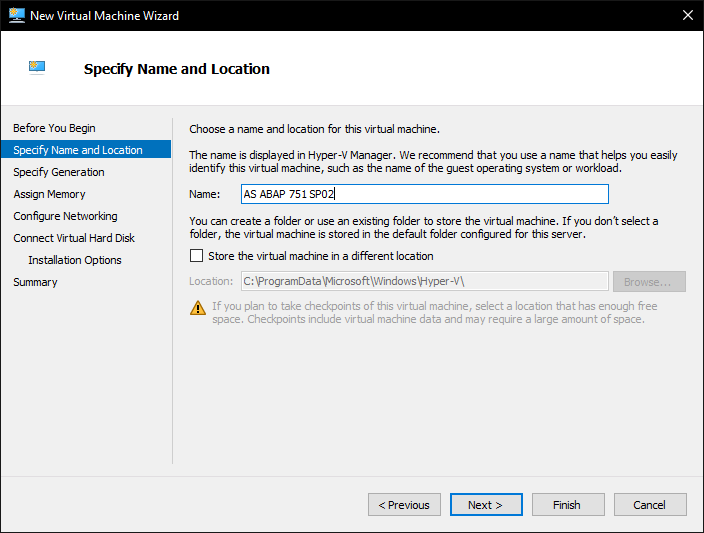 After a reboot you should now be able to open the Hyper-V Manager. If that doesn’t work or you run into errors you might need to enable hardware virtualization support in your BIOS. Before creating the new virtual machine some things about networking: If you want your application server to connect to the internet there are some additional steps to do. Hyper-V has 3 options for virtual switches that you can attach to the virtual machine. External will bind the virtual machine somewhat directly to a “normal” network adapter (of for example a physical network card) of your choosing. That means if the network adapter provides internet connectivity the virtual machine will be able to access it. That also means that the virtual machine gets its own external IP address and might be directly accessible from other points of the network. In the network adapter settings of Windows you will see a new Bridged-adapter that connects the virtual switch to the physical adapter. Internal means the virtual machine will be able to connect to the host machine and to other VMs on that switch. Private means the VM can only access other VMs that use that switch too. None of these options seem to fit for the use case in my opinion. I do not want the VM to get an external IP address. It should have a fixed one and not one given by some DHCP server that belongs to the Wifi network I happen to be in currently. Also I might have an AS ABAP installed on my laptop and one on my PC which are both on the same network. Since the hostname has to be vhcalnplci there would be a hostname clash in the network. But the other options do not provide an internet connection (which I need for abapGit). So what’s left? PS C:\> New-NetIPAddress –IPAddress 192.168.99.1 -PrefixLength 24 -InterfaceAlias "vEthernet (NATSwitch)"
These commands might only work on recent updates of Windows 10 as it is quite new. New-NetIPAddress will assign the Gateway IP address / subnet of the newly created switch. I recommend picking an IP range that is unlikely to clash with any other parts of your network. Back to GUIs and configuration wizards: Open Hyper-V Manager, right click on your computers hostname on the left and pick New -> Virtual Machine. IMPORTANT: Uncheck dynamic memory. If dynamic memory is used the installation of the ASE database will fail as it tries to allocate more memory than is currently available. You can enable it again later on if you want to, but I had some problems with that. If you are using the NATSwitch do not connect it yet to the VM (pick “Not connected” instead). This is just to prevent the Linux installer to freeze on boot as it tries to contact a DHCP server (I think). The other options (Default-Switch or External) can be connected directly. I recommend using ~150 GB as a hard disk. It is quite a bit of effort to expand it later on so some buffer should be useful. I tend to copy all the installation files of the AS ABAP into the VM to prevent filesystem issues that may occur when installing over a mounted “Windows network share” with CIFS, so there needs to be some space for that too. In the operating system dialog you can already select the ISO or just do it later. After that you should have a new virtual machine in the list. Right click on it and open the settings. Under “Processor” you might want to adjust the number of virtual processors in some way to the amount of physical CPU cores you have. I don’t know what the best ratio is here. I just noticed with 1 processor assigned the maximum physical CPU usage I get is 25% with an i7. So I put it up to 4. Once the virtual machine is created you can install the operation system. 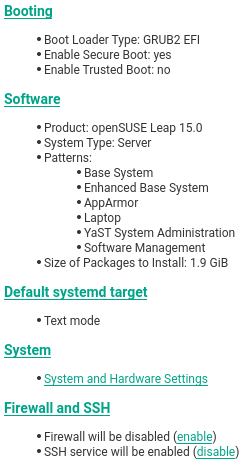 I always pick OpenSUSE Leap because it seems to work the best for me. Download the ISO from here. 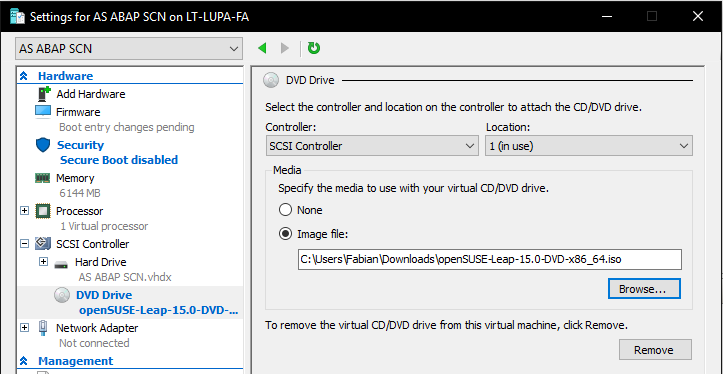 Go into the settings again, this time under SCSI Controller (which should be installed by default for the virtual hard drive) add a DVD drive and attach the SUSE-ISO file to it. Save the settings and connect to the VM by double clicking on it and press “Start”. You should now be greeted by the OpenSUSE boot selection menu of the installation disk. Press “Installation”. I suggest skipping these for now. If you are using the NATSwitch the network should not be connected at this point anyway. When I tried configuring the network here it was only saved within the installer and not in the OS itself afterwards. This is a server so pick “Server”. After the installation the VM should automatically reboot and show you the login screen. Login with the user you created and proceed having lots of fun, I guess. Navigate to System -> Network Settings using the arrow keys and press enter. You will get a message that currently the network settings are not managed by YaST. Therefore change “Network Setup Method” from “NetworkManager Service” to “Wicked Service”. You can navigate through these dialogs using the TAB key. Press next. In the “Hostname/DNS” tab you need to specify the new hostname “vhcalnplci” and you should also add some DNS servers of your choosing. For me these are the Google ones and the one of my home network. Go to “Routing” and change the “Default IPv4 Gateway” to the gateway you configured on the NATSwitch (for me that’s 192.168.99.1) for device eth0. Press OK and leave YaST. Restart the virtual machine. Next time you login you should now see the hostname has changed in the prompt and with a bit of luck networking should work. You can check by pinging Google using the IP for their public DNS server and their normal URL to check DNS does also work. You might want to ping a machine in your local network to see if that works as well (like the host machine). If everything’s fine I suggest creating a snapshot (or checkpoint as Hyper-V calls them). If it doesn’t work you have some network troubleshooting to do. For me I either had to restart the machine again or I messed up some of the settings mentioned above. You might also need to configure a proxy server if that is relevant in your network environment. I install some other packages as well. If you plan on extracting the installation files on the virtual machine you need some rar-compatible unarchiving software like unar. Alternatively you can extract the files on your host machine and just copy the result into the VM. To install the AS ABAP server you first need to download the installation files from https://tools.hana.ondemand.com/#abap. Currently 7.51 SP02 is the most recent one (7.52 should be coming soon). After you downloaded the 10 rar-archive-files you need to transfer them inside of the virtual machine (you could instead directly install it over the network but I had issues with that). There are several ways to do this. If that’s not the case you could share the folder with the downloaded files on your local machine and mount that. I do not know of a way to just attach a folder of the host machine without network sharing like you can do in VirtualBox. Create a new checkpoint here. I’ll describe the second approach as the other one is already documented and I cannot be bothered to remember any tar command syntax. The easiest way is to copy the file over from the mount point where your installation files were. With the cat command you should verify that the license is valid until some point in the future. Switch back to the installation using Ctrl+Alt+F1 and wait until it’s done. This means to system was successfully installed and is up and running. 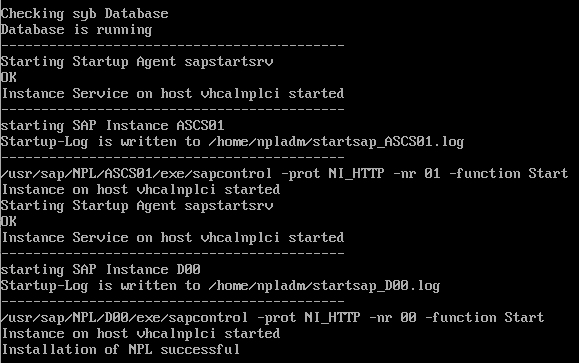 You can connect to it with SAP GUI using the NAT-IP address (192.168.99.10 here). For ADT and other web-based things to work you should add it to your host file and use the hostname vhcalnplci instead. Create a new snapshot / checkpoint now just so you can return to this point if needed. Why should I use Hyper-V though? This all may seem like a lot of effort compared to using VirtualBox. If you are content with VirtualBox then please feel free to use it. This guide is just for people who already want to or have to use Hyper-V. For example if you are using Docker on Windows it internally uses Hyper-V by default. This makes VirtualBox unusable like I mentioned in the beginning, so that is a use case. In my opinion it is also kind of nice to have the virtualization software behave more like a background service instead of a desktop application. thanks for the great guide. One comment regarding the data transfer for the SAP files – another easy way would be to do it over sFTP( e.g WinSCP) which work fine and doesn’t need some kind of share.